Gorgeous Indian designer Sarees with pure satin and half russel net fabric including unstitched blouse. Get the wedding sarees, stylish net sarees, Lehengas sarees and Indian occasional sarees in best price. 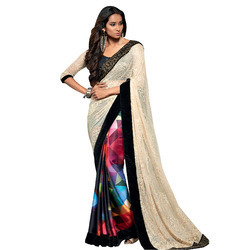 Innovation is our forte and we are engaged in offering a comprehensive range of Ladies Net Saree. Riding on unfathomable volumes of industrial expertise, we are providing a broad array of Net Saree.